Aside from the character of Hal/Henry, Henry V also continues the two previous plays' presentation of a whole palette of people rather than concentrating on just the titular individual. Based on our long and frequent experience with this company and our knowledge of the actors playing particular parts, we expected this to be a great performance of Henry V. It proved to be much, much greater than we expected. Certainly, the talents of individual actors had much to do with that, including Gregory Jon Phelps in the titular role, John Harrell as Chorus, and astonishing performances from Patrick Midgley, James Keegan, Allison Glenzer, Miriam Donald, and René Thornton Jr. in multiple roles. Certainly, too, the production’s direction under Ralph Alan Cohen contributed to our believing this the best of any Henry V we’ve ever seen. However, what ultimately made this performance so commanding was that this Henry V was played the way Shakespeare wrote it. Henry V is much more than Henry V. It is Fluellen and the other captains, it is Pistol and the other ruffians, it is the Dauphin and the other French lords, it is Katherine and the other French women. And it is Prince Hal all growed up. Watching this production, I was struck by how much Henry V is truly Part Three of the Hal story. Much mention is made of Henry’s raucous youth in this play. The French talk of it, the English talk of it, the Eastcheap gang talks of it, and Henry himself talks of it. That theme also is behind the Dauphin’s prankish embassy that ultimately gives spirit to Henry’s efforts against France. If in Henry IV, Part One, Hal tackles his reputation by killing Hotspur, and in Part Two he requites himself by banishing Falstaff, here in Henry V he buries his reputation and once and for all establishes his credibility at Agincourt. Just as both Hotspur and Falstaff are killed, in one way or another, at Hal’s retribution-seeking hand, the Dauphin's insulting joke puts all of France at peril. This ASC production produced a nice moment as the English embassy to the French court addressed Dauphin about his prank, King Charles VI (Thornton) and the other French lords were obviously hearing of it for the first time. The lords reacted in disdainful disbelief and the king reacted in agitated understanding of the consequences while the Dauphin, impishly played by Midgley, giggled and grinned. Everybody in the theater but he knew this was France’s “Uh-oh” moment. Yet, even as a now-successful king—even after Agincourt—Shakespeare’s Henry is not far removed from Shakespeare’s Hal. He disguises himself to mingle among the commoners, and he sets off a silly practical joke at Fluellen’s expense. Other productions trim the glove plot, often removing Fluellen’s role in it, but the fact that Hal, er, Henry is picking on the over-effusive Fluellen is as significant as Henry later showing benevolence to the soldier who challenged him. Phelps managed the many facets of Henry convincingly. He was regal and powerful in the court and battle scenes; he was so scary in his threats to Harfleur, his own lords looked disconcertingly on him; he was pensive and downright frightened as “Harry in the night”; he was the scoundrel punking Fluellen; and he was the young man treading the uncertain ground of courtship with Katherine. In that final scene, though, coming after three plays and much redemptive killing, the sun that Hal knew himself to be finally broke through the clouds to be “more wondered at” by a woman (and her attendant, too) he had truly fallen for. Aside from the character of Hal/Henry, Henry V also continues the two previous plays' presentation of a whole palette of people rather than concentrating on just the titular individual. This production not only didn’t scale back all these different characters in favor of honing the focus on Henry, it let each of these characters fully flourish. Characters such as the four captains at Harfleur, one of Shakespeare’s greatest scenes, that ASC played to the hilt with Keegan as Fluellen, Glenzer as Gower, Midgley as MacMorris, and Thornton as a barely understandable Jamy. Keegan’s Fluellen went on to dominate the play’s comic side. Characters such as the Eastcheap ruffians, with one of the tenderest presentations of Falstaff's death that I’ve ever seen as Benjamin Curns’ Pistol, Chris Johnston’s Bardolph, Zachary Brown’s Nym, and Miriam Donald’s Boy sat on the stage around a kneeling Glenzer as Mistress Quickly affectionately reminiscing on Sir John. Curns’ Pistol goes on to be more of a tragic figure, first in his inability to save Bardolph from hanging, and then in his beating and leek-eating at the hands of Fluellen. Characters like the French lords, the haughty Constable (Daniel Burrows), the cynical Orleans (Johnston) and, most of all, the Dauphin. Midgley played him as a spoiled brat, who might have overturned banquet tables at 6 years old and been applauded for it, who considered everybody, even his father, worthy of being made fun of. I’ve seen many an arrogant Dauphin, but never one so impish that even we the audience delighted in his spoiled ways. Characters such as Princess Katherine and Alice, played respectively by Donald and Glenzer, two non-French-speaking actresses who sounded fluent in that language but capably got the “le foot et le coun” joke across to the audience. Having established such charming personalities and clever capacities, they in the courting scene with Henry helped establish the man a mighty catch. Characters like the English soldiers, discussing with the disguised Henry the merits of duty to a king in a cause they did not understand, with Midgley’s Michael Williams becoming easily worked up under the tensions of their situation to challenge his unknown opponent. Even after Henry concluded his prank by giving the soldier a glove full of crowns, Midgley’s proud Williams saw no humor in the king’s behavior or requital in the crowns. And characters like us, the audience, represented by John Harrell’s delightfully spirited Chorus. In a theater like the Blackfriars, limited to the staging conditions of Shakespeare’s time—no sets and no electronic lighting or sound effects—Chorus was more than an allegory. He was our special effect, enjoining us to use our own imaginations to provide the settings and atmosphere “within this wooden…U,” as Harrell accurately called the theater. 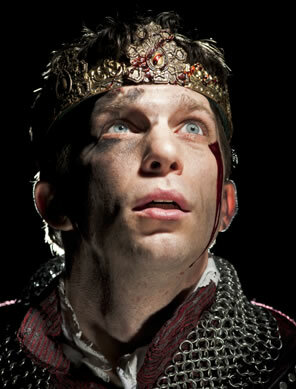 What made this production such a great Henry V? The playwright himself, plus a company that gets that, and an acting corps that brings Shakespeare’s multitude of vividly drawn characters to indelible life.